Nicky Smith claimed a hat-trick during Moorlands' defeat to Honley last Saturday but his figures of 3-31 24 hours later helped his side bounce back with victory over Golcar in the Drakes Huddersfield League Premiership. 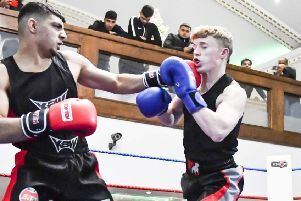 There were mixed fortunes for Mirfield Parish Cavaliers and Moorlands over a hectic double weekend in the Drakes Huddersfield Premiership. Mirfield Parish picked up a third straight victory last Saturday as they defeated Kirkburton by eight runs. Parish were bowled out for 169 as Nazar Hussain top scored with 41 and Daniel Hope (26no) supported, with Javaid Ahmed picking up 6-21 for Kirkburton. Opening batsman Andy Smith made 48 in reply but Hussain capped a fine game by claiming 5-50 as Kirkburton fell just short of the target. Parish’s recent revival came to an end with a 191-run defeat to Broad Oak on Sunday. Dominic Finn struck a superb 143 not out, including 20 fours and a six, while captain Jack Hargreaves (56) supported as Broad Oak posted 278-4. Opening bowlers Adam France (6-45) and Kiwi Kyran Dill (4-40) combined to dismiss the Cavaliers for 87 in just 22 overs. Moorlands suffered a first defeat of the season last Saturday as they went down by four wickets at home to Honley. Michael Rounding (54) hit a half-century for Moorlands but they were bowled out for 207 as Brett Randell (5-38) and Tom Craddock (5-43) impressed. Nicky Smith claimed a hat-trick in reply on his way to figures of 4-42 as Honley were reduced to 17-3. Ryan Robinson (61) led the Honley recovery, while Randell struck 55 not out as they won with three overs to spare. Moorlands bounced back on Sunday with an 81-run win over Golcar. Opener Jared Maxwell (65) and Nathan Rabnott (54) helped Moorlands reach 248-9, with Golcar overseas player Sam Mills taking 6-43. Nicky Smith (3-31) and Andrew Walker (3-33) helped dismiss Golcar for 167 despite Craig Ruscoe making 52. Mirfield slipped to a 64-run defeat to Marsden in the Conference last Saturday. M Butters and I Malik made 72 apiece in Marsden’s 236 as Nas Saudagar (3-54) and S Stenhouse (4-24) shone with the ball. Adam Goldthorpe hit 75 in reply but although B McGuinness (31no) supported Mirfield were bowled out for 172. The Drakes Huddersfield are looking for a new club for 2019 following Cawthorne’s decision to leave and join the South Yorkshire Premier League. Any club interested in applying to join should contact league secretary, Norman Clee at ncleedhcl@btinternet.com. Applications from clubs who are members of another Yorkshire league, must include a completed YCB Club Transfer Form, which allows their club permission to negotiate with another league. Resignations from current leagues must be made by June 30.